It was a vast civil engineering programme that diverted the resources of the nation. At fifteen sites across the country, from Durham in the north to Chichester in the south, Norwich in the east to Hereford in the west, thousands of men laboured to create marvels that would amaze their contemporaries. Their creations would become instant landmarks, the centre of civic pride in their local areas and a clear sign of the power and wealth of their patrons and creators. They would stand the test of time and many years later would remain some of the most popular and most visited buildings ever created. Am I talking about the great Victorian railway stations? Or Tudor England’s palaces and mansions? Perhaps the great Georgian terraces and squares that forced discipline out of unruly city streets? As important as these all are, they do not quite match the sublime splendour of England’s Norman cathedrals – an eleventh century building project like no other. The BBC4 documentary ‘How to Build a Cathedral’, hosted by architectural historian Jon Cannon, highlighted the structural challenge facing medieval master masons and builders. He also explained some of the reasons for this mammoth undertaking. William the Conqueror and his Norman host were keen to stamp their authority across their newly conquered kingdom. The Duke had won a crown, and many of his followers had been rewarded with vast estates, rich lands and titles. Temporal lords built castles, huge fortifications that served to cow restless locals and act as defensive bulwarks in case of rebellion. The ecclesiastical were similarly keen to stamp their mark on the landscape and impress on the locals the superiority of Norman French culture and sophistication. At this time bishops wielded huge power – levying heavy taxation, owning vast estates, directing their extensive retinues and subordinates and, at times, commanding their own armies. As a result, Norman England was soon experiencing a building boom never before seen across the land. Construction commenced on at least fifteen great cathedrals and all but two survive to this day. Old St. Paul’s finally succumbed to the Great Fire of London in 1666, but was replaced by Wren’s masterpiece. Old Sarum Cathedral was built on a hill close to modern day Salisbury but suffered from a poor water supply. As a result, King Richard I ordered its destruction and relocation of the bishop’s seat to a new cathedral in Salisbury. The remaining thirteen cathedrals have been reconfigured, extended and, in some cases, suffered partial destruction, but they have remained unbroken through the Reformation, civil war, urbanisation, the world wars and town planning. It is also worth imagining what these great medieval buildings would have looked like before the ravages of time and the Reformation stripped them of much of their colour and ornamentation. An idea of how they would have looked can be gained from this BBC programme on Wells Cathedral. It is absolutely fascinating – there is a lot of mystery around the master stonemasons of the medieval world. If anything, the French cathedrals of the time are even more spectacular. Very nice. I was working on a chapter for my book on the Normand Family in North America, and I wanted to say a bit about Norman architecture, when I found your website. Very nice. Excellent web page. 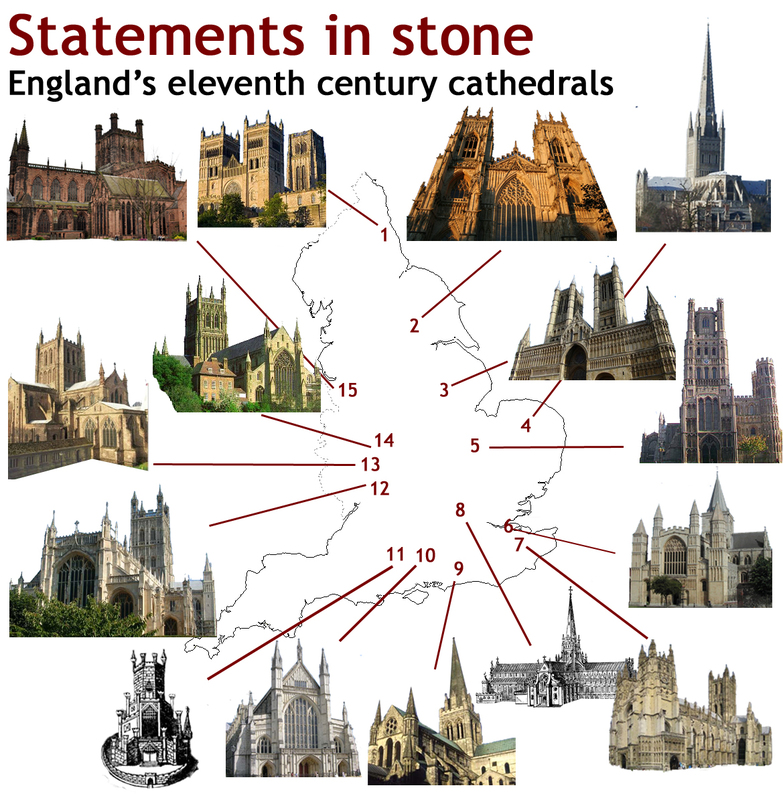 Is this the definitive list of medieval cathedrals? I am trying to identify a victorian image of what seems to me to be a medieval cathedral, but not listed here. This is a list of all of the English Norman cathedrals – so it excludes some that were started later but could still be classed as Medieval. The most accessible website showing them all (with pictures) is this: http://www.englishcathedrals.co.uk/cathedrals/ – hope this helps!